Looking for colorful, kid friendly entertainment this Easter? Throw in a little learning with this word scramble worksheet! Your child may not be saying "All I want for Christmas are my ABCs!" but, you can stay festive with lowercase letter practice. The sun is out for writing and sentence building practice this Easter! Work on sight words with your young learner. Let's practice positional words in the cemetery! This spooky 2-pager will help your child practice using prepositions to describe the location of items. 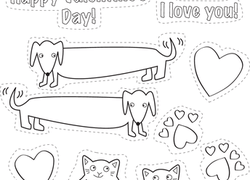 Cut and color with cats and dogs to make your own valentine! This worksheet will give your child great fine motor practice as she celebrates Valentine's Day! The spiders and ghosts have eaten up a lot of letters. Is your child brave enough to go inside this haunted house and fill in the missing ones? Read the clues to find out who's who in this fun, Halloween-themed problem solving challenge. 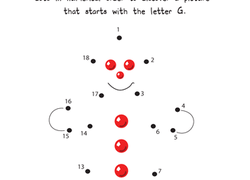 Celebrate the season with this Christmas dot to dot. Find out what kind of cookie begins with the letter G and practice counting.